Airports, Harbors, Ports, Railways, Pipelines, Highways, and Bridges make much of infrastructure and facilities the modern world relies upon for transportation. They are the entry and exit points for both domestic and international travel, and the infrastructure for the transshipment of people, freight, and cargo. While border crossings, airports, ports, and railroads get much of the attention and security resources, there are over 600,000 highway bridges in the United States alone. All of this infrastructure requires attention. “Ease of installation, compatibility with our current VMS, and the new features [including] Wide Dynamic Range. Our experience has been great. In the check-in area for an airline, train station, or cruise ship terminal, three Arecont Vision SurroundVideo® IP megapixel panoramic cameras provide superior coverage and higher quality images than 11 analog cameras. 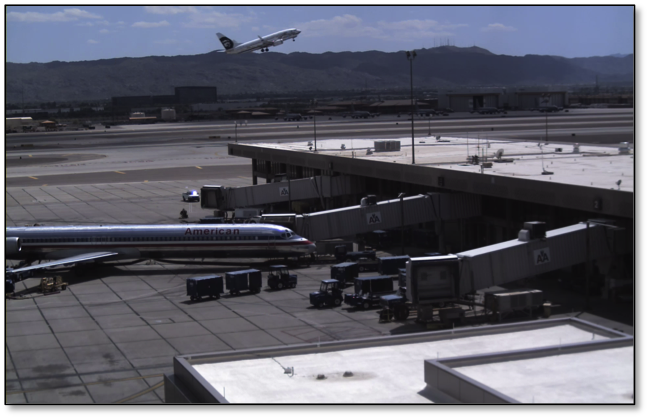 In passenger terminals, a single Arecont Vision SurroundVideo® IP megapixel panoramic camera provides outstanding situational awareness and 180 to 360 degrees of non-stop coverage. Any part of the scene can be digitally zoomed in as needed, without disrupting active recording of the entire scene. A single SurroundVideo panoramic camera provides superior outdoor coverage. A SurroundVideo panoramic 180 camera in this example provides coverage of an airport runway at night. Fewer cameras are required to provide coverage of a large space than would be needed with analog as in this cruise ship example. Arecont Vision SurroundVideo panoramic cameras can further reduce the numbers needed while delivering improved video quality and complete situational awareness. Dams, bridges, transmission lines, and highways are important areas of transportation infrastructure to provide coverage. A single Arecont Vision SurroundVideo® IP megapixel panoramic camera can provide outstanding situational awareness. In an airport, train station, bus terminal, or cruise ship security screening area, half the number of Arecont Vision IP megapixel cameras provide superior images and better imagery than analog cameras.